A heavenly rich, full-flavored expression: barrel proof and unfiltered. 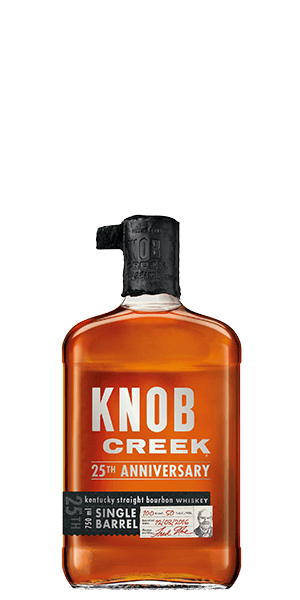 Knob Creek is a brand of Beam-Suntory, but it is one of their special “small batch” brands. Along with it’s sister labels — Booker’s, Baker’s, and Basil Hayden’s — it is tailored to the more discriminating Bourbon lover (and that means you). The Knob Creek brand was first launched in 1992, and since then they have changed very little. But they have started producing additional products, including a Single Barrel Reserve, a Straight Rye, and a Knob Creek Maple Bourbon. And they do all of them right, winning awards and turning heads. Knob Creek’s core Bourbon and Rye are the go-to Whiskeys for mixing cocktails and their Single Barrel Reserve is a great sipping Bourbon too. But Knob Creek 25th Anniversary Bourbon is something special indeed. First, it’s a single barrel product released at barrel proof. That means it’s un-vatted, un-cut, and will range in age from twelve to thirteen years. So there will be slight differences in flavor profile and final proof from batch to batch. It’s also unfiltered — they only strained out the bits of char and wood, leaving everything else that naturally occurs in Bourbon right were God intended. Oh… and each individually numbered bottle tastes fantastic. If this doesn’t sound special to you, then you probably need to read this again. What does Knob Creek 25th Anniversary Single Barrel Bourbon taste like? The Flavor Spiral™ shows the most common flavors that you'll taste in Knob Creek 25th Anniversary Single Barrel Bourbon and gives you a chance to have a taste of it before actually tasting it. Cinnamon, caramel, oak, and tobacco. Delectable and bold, with basket of vanilla holding roasted pecans, oak, and baking spices. Long and spicy with cinnamon and leather. Sweet, and spicy. The caramel comes on strong and so does the spice. Long finish. Leather pulls in the side of your tounge and you can feel the char on the breath.